CoderDojo Waterloo was founded as a bilingual Dojo (French and English) to accommodate both the kids from Waterloo (Wallonia) and the kids from families of expats around Brussels. Just like our ninjas, our coaches are multinational and come from all over the world. To stimulate kids in developing their coding and soft skills, we actively use the belt system. To learn more about it, check out this link. 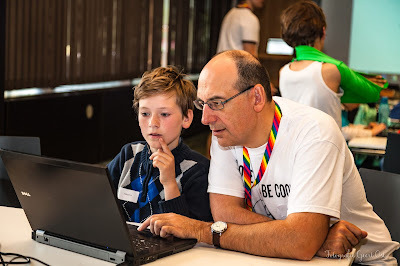 Coaches and cooks are the heart of the CoderDojo and without their contribution, this initiative wouldn’t be possible. That’s why we should show them how important they are on an everyday basis. For example, an applause for coaches at the end of the Dojo, acknowledgement of the coaches on your Dojo’s website, a specially organized team building event, etc.